My favorite cake is my Aunt Cathy’s red velvet cake. I have yet to taste another red velvet cake as good and trust me I try a piece or cupcake any chance I get 😉 Don’t worry I will be sharing that recipe. My love for this cake has translated to loving anything red velvet including ice-cream – yum and twinkies – yes they make red velvet twinkies (probably called snack cakes or something else as I think Twinkies is trademarked). It is a regional thing, I guess because I have only found them in an area of Ohio which is a good thing, I guess or I would be eating them all the time! 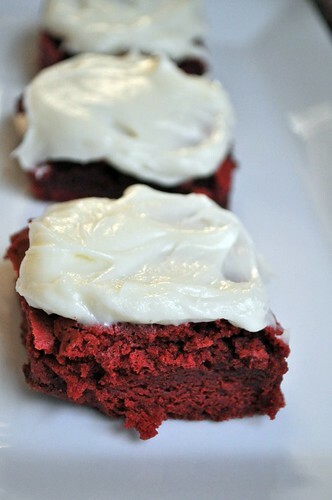 When I saw red velvet brownies on Smells Like Home, I knew I had to make them. Tara of SLH used white chocolate buttercream icing, which sounded delicious but I had some cream cheese and decided to use a half-batch of the frosting from my Aunt Cathy’s red velvet cake recipe. These were amazing! These would be a great addition to a goodie plate for the holidays or for tailgating. 2. Grease and flour an 8-inch square pan. 3. In a small bowl mix the cocoa powder, food coloring, and 1 teaspoon vanilla to make a thick paste. Make sure no lumps of cocoa remain. 4. In a large bowl, either by hand or in a mixer, beat the butter and sugar until light and fluffy (about 2 minutes on medium speed if using a mixer). 5. One at a time, add the eggs, mixing well after each addition. 6. Mix in the remaining teaspoon of vanilla to the butter mixture. 7. In a separate bowl, mix the flour and salt; set aside. 8. If using a mixer, turn it off and add the cocoa mixture. Turn the mixer on to medium and beat until the cocoa mixture is mixed in. 9. With the mixer on medium-low, slowly add the flour and salt mixture. Turn off the mixer, scrape the sides and bottom of the bowl to ensure everything is mixed in. Continue to mix until incorporated. Do not overmix. 10. Pour the batter into prepared pan and bake for 30-40 minutes (check at 25 minutes), or until a toothpick inserted into the center of the brownies comes out clean. 11. When brownies are done, cool completely in the pan on a wire rack. 12. When brownies are cooled, either frost in the pan, cut and remove or remove from the pan, cut, and frost. 1. Either by hand or in a mixer cream the butter and cream cheese until mixed well. 2. Add powdered sugar and vanilla. Beat until light and fluffy, about 2 minutes.